It was a fun read. The computer content is a little too abstract to learn much from, but good as an inside joke for those who already know it. It gets compared to The Phantom Tollbooth, and was definitely trying for that feeling, but didn't really come close to the story and characters. Full Disclosure: The Phantom Tollbooth has been one of my favourites since I was 4 years old, so I may be ever so slightly biased. 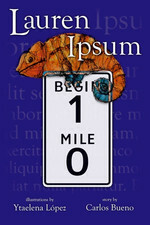 Sign into Goodreads to see if any of your friends have read Lauren Ipsum.